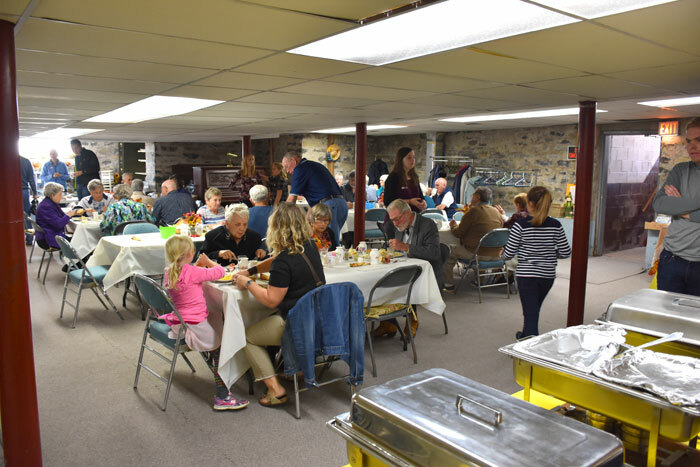 The afternoon-evening of Saturday, 30 September Munster Church held its annual fall supper. The decision had been made to offer a meat a little different from what other area suppers have and had been offering (ham and turkey) and we had The Beckwith Butcher of Carleton Place prepare and cook our roast pork. What a fine decision based on feedback from many of our customers It was delicious, moist, and tender – for what more could one ask? There was no waiting for anyone eating with us. 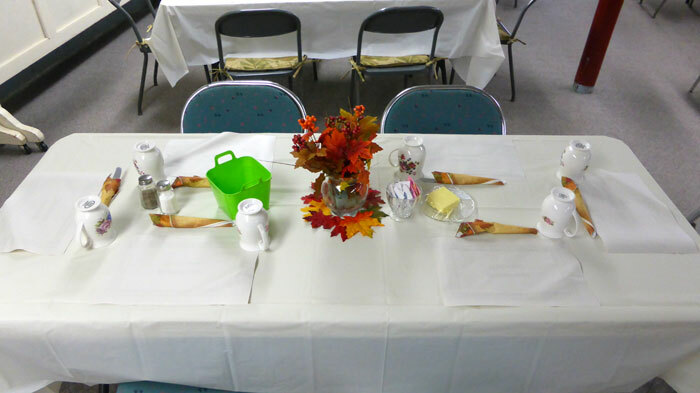 Our buffet table had hot corn, hot peas, hot mashed potatoes, hot roast pork, apple sauce, hot gravy, and coleslaw. On the tables we had pickles, dinner rolls, and butter. Our tables at the back held a delicious assortment of homemade pies. The writer thinks everyone had their feed of the type or types of pie they were looking to taste and enjoy. 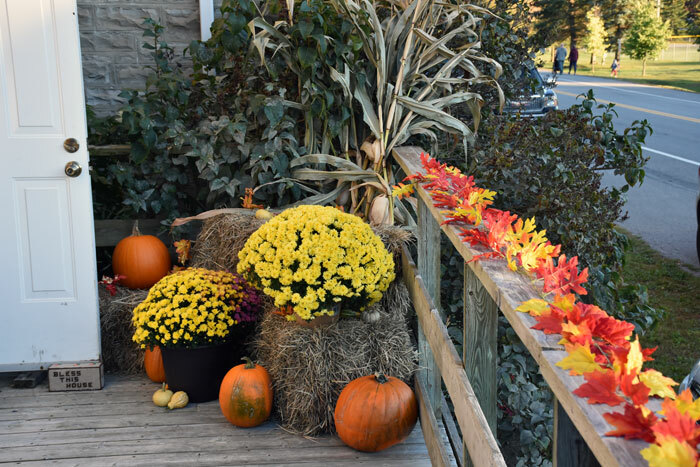 On Thursday and Friday mornings, our organizers and some helpers set up the tables, chairs, set places, and attractively decorated the tables with centrepieces. Our help was well organized. We enjoyed enthusastic members of our Pastoral Charge Youth Group helping with a variety of jobs. It was a pleasure to work with each of them and it appeared they had fun serving people and clearing tables. The kitchen staff worked very hard to keep the buffet servers stocked with delicious food to serve. The servers welcomed and greeted hungry people then served the food they wished. We had a few others helping and they worked very hard too and fit in very well. Out thanks go to all these willing people for all they did, to help serve customers, and to help make our supper a success. Cleanup afterwards seemed to go smoothly as well and it seemed too that it took a little less time than in previous years. Below are a few photos of the evening. 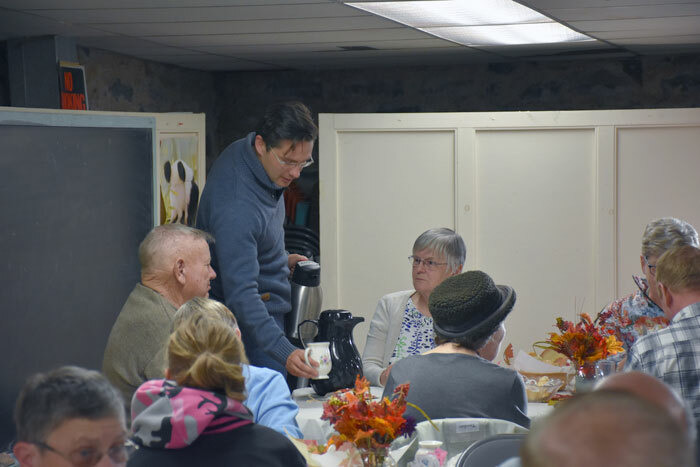 I will add that Pierre Poilievre, our MP in federal parliament, grabbed a carafe of coffee after enjoying his meal and started serving others. He chatted with people while topping up cups. He wasn’t just flitting about but was relaxed; he took time to stop and speak with people and listen to them and any concerns.